BROWN OUT: Tim Beusmans with a 7lb brown trout from Lake Purrumbete. Fantastic fishing was enjoyed right across the region over the past week. Corio Bay’s inner-harbour produced the goods, with land-based anglers finding good size pinkies holding around structure and willing to attack soft-plastic Turtleback worms. Fishing the same structure also accounted for catches of bream on yabbies as bait. Snotty trevalla were caught right along Geelong’s waterfront, with Cunningham Pier always a hot spot when fishing chicken under a small float. The odd snapper was again caught from the edge of the channel, around the turn out from Clifton Springs. As the weather improves and water starts to warm we can only expect the snapper fishing to improve. The excellent squid fishing continued along the Bellarine Peninsula, with reported bag-limit captures from Clifton Springs right around to Queenscliff. White Jigs in size 3 to 3.5 seemed to be a favourite. Ater a month or so of unfishable conditions at Apollo Bay it was great news to hear of barrel tuna in excess of 120kg caught off Cape Otway on X-rap 30s and skirted lures. Other reports suggested the tuna were also caught further around the coast off Peterborough. Freshwater fishing was also great, with a very successful trout season opening. Anglers flocked to rivers and streams across the state, with our local Otway streams producing the goods for Peri Stavropoulos, of Trelly’s Geelong, and mate Jamie Marsh. They fished a number of streams around Apollo Bay, managing around a dozen fish for the day and many more either spitting the hooks or following the lure to the bank. Peri and Jamie said casting small, shallow-diving minnow lures worked well. Lake Purrumbete was back on the radar with trout to 9lb caught. 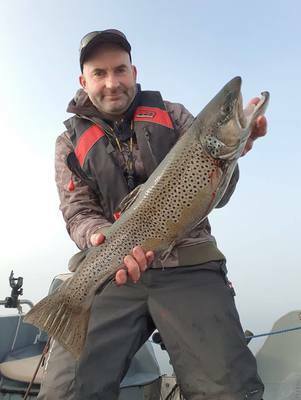 Tim Beusmans was among the few who caught big fish last week, with a healthy 7lb brown trout. Trolling Tassie Devils around the eastern margins of the lake at first light then down-rigging in deeper water later in the morning was an effective method of producing the big fish. Redfin are always a consolation prize and are commonly caught as bycatch or can be specifically targeted with scrub worms or yabbies dropped into the thick schools of fish once located.